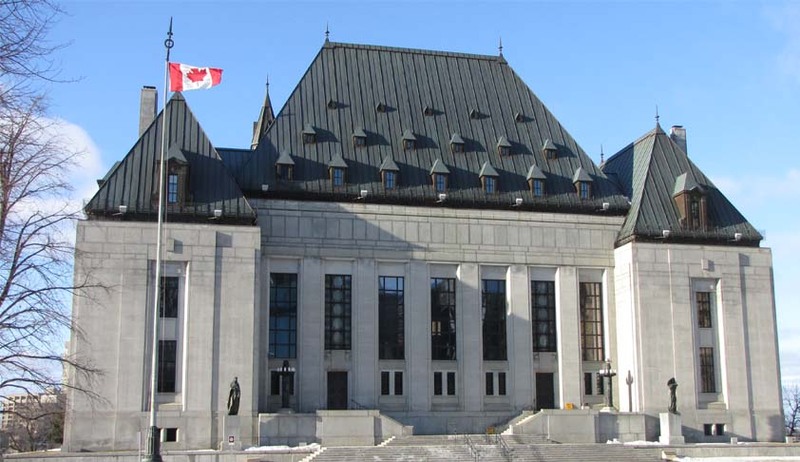 A 7 judge bench of the Supreme Court of Canada has struck down sections of the federal anti-terrorist financing law reasoning that it violates solicitor-client privilege. This judgment marks the end of a 15-year battle between Canada's lawyers with the federal government over the lawyers' right to protect their relationship with their clients. The law required them to keep track of and report their clients' financial activities to the government. FINTRAC (the Financial Transactions and Reports Analysis Centre of Canada) is a federal agency responsible for detecting, preventing and deterring money laundering, terrorist activity financing and other threats to the security of Canada. Financial institutions and intermediaries, as well as real estate agents and accountants, have to report to FINTRAC. The agency has the power to search documents and discloses suspicions of money laundering or of terrorist financing activities to police authorities and CSIS. The majority opinion (5 judges) speaking through Cromwell J said that the legal powers of FINTRAC ‎violate the Constitution in the way it applies to lawyers. The court found that the parts of the law which give authorities sweeping power to search and seize files from lawyers' offices without a warrant carry an inherent risk of breaching solicitor-client privilege. It also recognized for the first time the constitutional protection of lawyers against any influence that undermines their relationship with clients. That's a new principle of fundamental justice to be considered under section 7 of the charter. The decision also reiterated that warrantless searches are "presumptively unreasonable," although it notes that Parliament "could devise a constitutionally compliant inspection regime" that wouldn't require a warrant. "The search powers ... as applied to lawyers, along with the inadequate protection of solicitor-client privilege ... constitute a very significant limitation of the right to be free of unreasonable searches and seizures,". In a partially concurring judgment, the Chief Justice gave a different reasoning that breach of the principle alone is sufficient to declare the impugned provisions unconstitutional irrespective of any violation of the solicitor client privilege. Canada's lawyers have fought the anti-money laundering law since Jean Chrétien's Liberal government brought it into force in 2000, arguing it turns lawyers into agents of the state. Law societies have established their own anti-money laundering rules and have been exempt from the current law while the case made its way through the courts. However, the anti-money laundering law will continue to apply to financial institutions and accountants, as well as to real estate firms.